Guided tours crafted for travellers who love exploring, enjoy walking and adore experiencing the local way. Visit the secret spots of Santorini away from the hustle and bustle, walking through ancient paths and picturesque cobblestone alleys. Marvel at the famous caldera, explore whitewashed villages forgotten by time, and take in the amazing scenery in a responsible and eco friendly way. Your local guide will take you through traditional whitewashed settlements, at the only inhabited caldera in the world. Marvel at the azure sea and the breathtaking landscape, learning about the rich myths and history of Santorini. Starting from Fira and ending in Oia, you will enjoy extraordinary views, visit unique places of interest and capture exceptional photographic moments. This Santorini Walking Tour will immerse you into the island life, enjoy the bright sky, the endless horizon, and the true wonder of nature that Santorini is. Price: 75.00 Euro per person, including transfers from/to your hotel, English speaking experienced walking guide, snack & refreshment. Experience the absolute splendor of Santorini, while strolling through some of the most scenic and quiet villages of the island. Walk alongside beautiful mansions, explore quaint rural houses and discover the charm of Santorini’s abandoned neighbourhoods. Visit a traditional winery to taste the local volcanic wines, and stop by a unique microbrewery for a fresh beer tasting experience. Price: 75.00 Euro per person, including transfers from/to your hotel, English speaking experienced walking guide, Wine tasting session of 4 unique locally produced wines, Beer tasting session of 3 different types of fresh beer, snack & refreshment. Join us for a scenic tour of Oia’s secret spots, and the beauty of the surrounding villages. Discover blue domed whitewashed churches, walk through a picturesque village sculpted into the banks of a ravine, and tour a wine estate while enjoying a wine tasting session of high quality volcanic wines. Your local guide will take you on a journey back in time, through a winding path with stunning panoramic views of Santorini and the deep blue horizon. Follow the footsteps of the affluent merchants of the island, feel the energy of the volcanic caldera, and explore the backroads of Oia. Discover and experience breathtaking villages through the eyes of a local. This walking tour will give you the opportunity to enjoy amazing views, learn about Santorini’s rich history, and visit some of the wonderful little known spots of the greater Oia area. “Santorini Walking Tours” guided private tours offer you the chance to take your own pace, and enjoy a unique experience put together exclusively for you. Let us know about your preferred mix of walking, culture, views, heritage and beaches, and our experienced local guides will ensure you have a memorable experience, crafted and executed with imagination and fun. Get as much or as little action as you wish, and enjoy a private walking tour that matches your exact preferences. Feel free to choose any of the available tours, or have us design one just as you want it. “Santorini Walking Tours” is here to guarantee you will have a customized tour experience, taking you out of the guidebooks to see the island from a different perspective. The private or customized tours of “Santorini Walking Tours” are ideal for travellers that prefer travelling and touring in their own way. Please email us at tours@santorini.net for more details. WHAT IS A SANTORINI WALKING TOUR? Santorini Walking Tours offers recreational walking tour experiences, designed to introduce people to the hidden corners of Santorini. They are planned around the average traveler, but we have made sure to include information, sites and places of interest that she or he could not have access to easily. Our tours combine walking with sightseeing, intended to take you to off the beaten path places, revealing the true identity of Santorini. While the schedule of each tour is prearranged, there is always the flexibility to make changes according to your requests and needs. We believe that travelling and touring should be flexible, and we adapt each tour so that it exposes you to the right amount of our tour’s success ingredients. Fun, culture, and scenery have been carefully blended in the mix, but we are always open to other elements and to your suggestions. We only allow travelers above the age of 14 on our small group tours. Travelers of all ages can participate only on our private tours. WHEN ARE THE TOURS CONDUCTED? 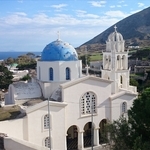 Santorini Walking Tours operates throughout the year. Keeping your well-being and maximum enjoyment in mind, our tours are conducted weather and conditions permitting, and starting time might vary. Santorini Walking Tours has the right to amend or cancel a tour due to adverse weather conditions. Wear comfortable walking shoes, a hat, and standard walking apparel, depending on the season and the weather. Carrying one litre of water is also necessary, and so is wearing sunscreen. A walking stick is also advisable since it will provide you with better support on slopes or narrow steps. If you plan to swim in the sea (in tours offering this option) please bring a towel and a swimsuit. Feel free to let us know, if you would like us to provide any of the above items. Santorini is a volcanic island, offering a fascinating variety of walking surfaces. In many cases there are rocky steps, and the terrain is occasionally steep or uneven. The ground ranges from soft soil to big rocks, and from black sand to light pumice. Our tours are not suitable for people with walking difficulties, strollers and wheelchairs. HOW DIFFICULT ARE SANTORINI WALKING TOURS? Our tours are conducted at a comfortable pace and cover anywhere between 4 to 10 kilometers (2.5 to 6 miles). They are of low to moderate difficulty, and the elevation gain ranges anywhere between 100 to 400 meters (330 to 1300 feet). They are all geared towards the average active traveler, and are designed to be relaxing yet dynamic. While we could shorten them if need be, you will enjoy them more if you have a moderate level of fitness. Ready to book? Just fill out our secure form below, giving us three date/time preferences and we will contact you to confirm your booking and give specific pick-up times.